The John Deere 310L EP Backhoe and 210L EP Tractor Loader are the latest construction equipment models to undergo updates, with a focus on engine technology and other model adjustments to improve productivity and uptime, and lower daily operating costs. “Our goal is to continue to support the ‘EP s..
Volvo Construction Equipment has expanded its H-Series 2.0 updates to the L60H and L70H wheel loaders. “With the L60H and L70H joining the previously announced L90H 2.0, we have completed the H-Series update for our mid-size wheel loaders,” said Chris Connolly, product manager, wheel loaders, Volvo.. The new Cat 903D compact wheel loader delivers increased performance – 25 percent more lifting capacity and travel speed, compared to its 903C2 predecessor – and expanded work tool capability. Its power train uses a fuel-efficient, Tier 4 Final, Cat C2.4 engine, rated at 40 net horsepower, and hydr..
Ditch Witch, a Charles Machine Works Company, released a new JT20XP horizontal directional drill (HDD) package featuring a JT20XP drill and XP44 mixing system. The industry-first solution is the only drilling system in its class to utilize all on-board horsepower for thrust and rotation. Together, t..
Northwest Pipe Company acquired Ameron Water Transmission Group LLC for $38.3 million. Northwest Pipe Company, Vancouver, Wash., is the largest manufacturer of engineered, welded steel pipeline systems in North America. With strategically located manufacturing facilities, the company serves a wide r.. The Buried Asset Management Institute-International (BAMI-I) and Underground Construction Technology Association North Texas Chapter (UCTA-NT) have teamed up to present Certificate of Training in Asset Management (CTAM), Nov. 5-8, at the Upper Trinity Regional Water District Administration Building ..
Farm Depot Ltd., a full-line agricultural and construction equipment dealer, has joined the Hyundai Construction Equipment Americas (HCEA) network. The third-generation, family-owned company provides products and services through locations in Caro, Ionia and Schoolcraft, Mich., across the state’s so..
October 2018 NASSCO Tech Tips – download pdf ..
Perma-Liner Industries LLC, a leading manufacturer and supplier of trenchless pipeline rehabilitation equipment and materials in North America, introduced its new vertical connection pipe lining system. This latest technology changes the way contractors and companies approach and repair vertical pip..
Quadex LLC received “Reduced Carbon Footprint” Certification by SCS Global Services, an internationally recognized sustainability certification body. The honor was awarded to Quadex’s GeoKrete geopolymer mortar for its lower overall carbon footprint – 51 to 59 percent smaller, compared to Portland a..
Second in a 3-Part Series EDITOR’S NOTE: This is the second of a three-part series on pressure pipe presented by the NASSCO Pressure Pipe Committee. There will be an in-depth program track on these topics and more at UCT, Jan. 29-31, 2019, in Fort Worth, Texas. Every water main rehabilitation proje.. Using what some are calling the largest French drain ever constructed, Sheppard Air Force Base in Wichita Falls, Texas, has eliminated ponding between two of its runways. The swamp-like area attracts birds such as the Cattle Egret, which struck a T-38 supersonic fighter training jet and caused it to..
EF-3 Tornado Damage is Overcome Quickly to Restore Operations After suffering a devastating tornado in July, Vermeer Corp. officers announced that, as of early September, the company had restored its full manufacturing capabilities, and was actively building and shipping products for the undergroun..
Join industry professionals in honoring the 2019 Most Valuable Professional, Lynn Osborn, at the annual UCTA and Underground Construction magazine MVP Award Banquet on Tuesday, Jan. 29, during the Underground Construction Technology (UCT) International Conference & Exhibition, in Fort Worth, Texas. .. The Utility & Communications Construction (UCC) Index underwent another update as the Granite acquisition of Layne Christensen was approved during the past quarter. Per the three-year (Figure 1), one-year period (Figure 2) and year-to-date (Figure 3) Index, the market is viewing the growth prospects..
by Stephen Barlas | Washington Editor Federal regulators are taking another look at the pipeline industry’s request to essentially eliminate the class location method for assessing the need for pipe replacement and change it by expanding integrity rules beyond high consequence areas (HCA). The Pipe..
A new rate structure for all 1.8 million WSSC customers in Montgomery and Prince George’s counties (Maryland) was approved to go into effect July 1, 2019. Maryland Public Service Commission (PSC) directed the change after ruling WSSC’s current 16-tier structure to be unreasonable because it was und..
Hydra-Flex Inc. placed No. 2972 on the annual Inc. 5000, the prestigious ranking of the nation’s fastest-growing private companies. As only one of 154 manufacturers on the list, Hydra-Flex earned its spot due to its three-year revenue growth of 137 percent. “The combination of a great team, inventiv.. Global water technology company, Xylem, has been included on FORTUNE’s 2018 “Change the World” list, a ranking of 50 companies that have made a significant social impact through their core business strategy. Listed as number 7 in the ranking, Xylem was recognized for creating tangible social value t.. The U.S. Environmental Protection Agency (EPA) has awarded a $699-million, low-interest loan to the San Francisco Public Utilities Commission (SFPUC) to help finance its innovative Southeast Treatment Plant Biosolids Digester Facilities Project. 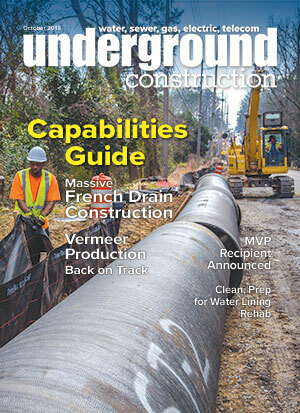 Under the EPA’s Water Infrastructure Finance and Inno..
by Robert Carpenter | Editor-in-Chief It was a cloudy September day with steady rainfall, yet bright smiles filled the faces of virtually all employees at the Vermeer facilities in Pella, Iowa. There was a lot to smile about. After the trauma the Vermeer community had experienced last summer, they ..